Things are heating up in Syria’s Manbij, located in the northeast of the Aleppo governorate, after U.S. President Donald Trump decided to withdraw all U.S. troops from Syria, and as Turkey’s military operation looms. It has been revealed that security teams linked to Egypt’s leader Abdel Fattah el-Sisi, who is in serious competition with Turkey in the East Mediterranean, made contacts in Manbij. Security sources have also said that some Emirati figures also partook in the visit. It was reported that the delegation is coordinating steps to be taken against Turkey. 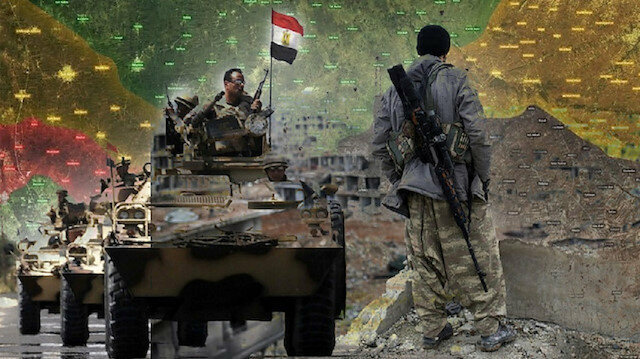 Syrian state-run SANA news agency reported on Friday that regime forces entered the PYD/YPG-held city after the terror group invited Syrian forces to take control of the region and ward off an announced Turkish operation. Turkey sees the group an extension of PKK terrorist organization. A U.S. defense official later denied reports Syria's Bashar al-Assad regime forces entered Manbij. Turkish President Recep Tayyip Erdoğan also responded to reports of regime forces entering Manbij in coordination with the YPG/PKK terror group, saying the Assad regime is running a “psychological” operation. "We know that Syria is trying to conduct a psychological operation. We know that there is a situation like them raising their own [regime] flag there. But there is nothing definite there yet," said Erdoğan. Top Turkish officials were in Moscow on Saturday to discuss the situation in Syria. “First, we discussed solutions to humanitarian issues, the creation of conditions for the return of refugees,” said Russian Foreign Minister Lavrov, adding: “Special attention was paid to the new situation developing in connection with the U.S. military withdrawal from Syria." “And an understanding was reached on how the military representatives of Russia and Turkey will continue to coordinate their steps on the ground amid the new conditions, with a view to the final eradication of the terrorist threat on Syrian soil,” he added. As Turkey continues its military deployments to the region, Turkish intelligence officials are surveying the area 24/7 and reporting back to headquarters. Turkey has repeatedly voiced frustration over what it says is the slow implementation of a deal with Washington to pull YPG terrorists out of Manbij, a town in mainly Arab territory west of the Euphrates. U.S. commanders planning for the withdrawal of U.S. troops from Syria are recommending that terorists from the Kurdistan Workers' Party (PKK) be allowed to keep U.S.-supplied weapons, four U.S. officials said, a move that would likely anger NATO ally Turkey.Three of the officials, speaking on the condition of anonymity, said the recommendations were part of discussions on a draft plan by the U.S. military. It is unclear what the Pentagon will ultimately recommend to the White House.Discussions are still at an early stage inside the Pentagon and no decision has yet been made, the officials said. The plan will then be presented to the White House in the coming days with U.S. President Donald Trump making the final decision.The Pentagon said it would be “inappropriate” and premature to comment on what will happen with the weapons.“Planning is ongoing, and focused on executing a deliberate and controlled withdrawal of forces while taking all measures possible to ensure our troops’ safety,” said Commander Sean Robertson, a Pentagon spokesman. The White House did not comment.Trump last week abruptly ordered a complete withdrawal of U.S. troops from Syria, drawing widespread criticism and prompting Defense Secretary Jim Mattis’ resignation.The United States told YPG terrorists that "they would be armed by Washington until the fight against Daesh was completed," one of the U.S. officials said.“The fight isn’t over. We can’t simply start asking for the weapons back,” said the official.But Turkey wants the United States to take the weapons back, so the commanders’ recommendation, if confirmed, could complicate Trump’s plan to allow Turkey to finish off the fight against Daesh inside Syria.Turkey has been reinforcing its military presence on the border with Syria since Turkish President Recep Tayyip Erdoğan signaled that Ankara will soon launch a cross-border operation against the terrorist YPG/PKK in northern Syria.Since 2016, Ankara has successfully carried out two similar military operations in northern Syria.In its more than 30-year terror campaign against Turkey, the PKK -- listed as a terrorist organization by Turkey, the U.S. and the EU -- has been responsible for the death of some 40,000 people, including women and children. The YPG is its Syrian branch.The Pentagon keeps records of the weapons it has supplied to PKK/YPG terrorists and their chain of custody. But, the U.S. officials said, it would be "nearly impossible to locate all of the equipment. "“How are we going to get them back and who is going to take them back?” one of the officials asked. A curfew has been imposed in Syria’s Manbij by nearly 7,000 heavily-armed terrorists from the Kurdistan Workers’ Party (PKK) that are currently deployed in the city ahead of an imminent Turkey-led operation and following U.S. President Donald Trump’s decision to withdraw troops from the country. After their so-called leaders fled the city, close to 7,000 panicked PKK terrorists remain in Manbij, which were spotted by Turkish fighter jets flying on low altitudes over the region. After spotting Turkish Air Force jets flying over the area, Assad fighters immediately abandoned the nearby town of Arimeh.PKK terrorists, armed with American armored vehicles and weapons, imposed a curfew in the city center after a possible U.S. pullout drove France, Assad and the PKK to try to fill the vacuum. Approximately 2,000 PKK fighters were dispatched to Manbij over the past two weeks.A U.S. defense official on Friday denied reports Syria's Bashar al-Assad regime forces entered Manbij.US, YPG/PKK kill 165 Syrian civilians in three months: NGOTurkey sends howitzers to Syria borderSyrian state-run SANA news agency reported earlier in the day that regime forces entered the PYD/YPG terrorist-held city after the group invited Syrian forces to take control of the region and ward off an announced Turkish operation. Turkey sees the group an extension of PKK terrorist organization. "The reports on regime incursion in Manbij are inaccurate," the official told Anadolu Agency on condition of anonymity.Erdoğan also responded to reports of regime forces entering Manbij in coordination with the YPG/PKK terror group, saying the Assad regime is running a “psychological” operation. "We know that Syria is trying to conduct a psychological operation. We know that there is a situation like them raising their own [regime] flag there. But there is nothing definite there yet," said Erdoğan. Assad’s Shabbiha entered Manbij Fearing a massacre, Manbij residents were alarmed upon hearing news about Assad’s forces entering their city, particularly after a large number of Assad’s Shabbiha paramilitary forces were smuggled in in coordination with PKK terrorists.Video: Turkey deploys more military vehicle to Syrian borderTerrorists not withdrawingFollowing claims they were fleeing Manbij and handing it to Assad forces, PKK terrorists were spotted everywhere in the city, as they attempt to spy on the movements of the Turkish Armed Forces (TAF) across the border using binoculars. PKK terrorists also work uninterruptedly on digging trenches near the border with Turkey and in Euphrates Shield regions, as they continue to parade in groups to project false displays of strength ahead of Turkey’s upcoming operation.Turkish F-16 jets over Manbij Turkish F-16 fighter jets were also spotted over Manbij, as U.S. helicopters, which regularly flew over the city, were nowhere to be seen. It is also striking that this development comes just as Turkish and Russian officials concluded their Syria meetings in Moscow.